Casino Land will then reward you with a bonus (Welcome Bonus is for new players only). The terms and conditions of the bonuses vary between different casinos and might also change over time and between different countries, so it is important to compare the different offers and read the T&C for Casino Land before signing up. CasinoLand Casino believes online gambling should be a fan, hassle-free activity and is determined to deliver accordingly. 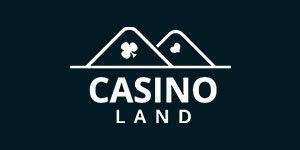 The CasinoLand Casino, launched in December 2015, tries to keep things as simple as can be. You’ll find no bells and whistles, only a secure environment to play great games and make easy deposits and withdrawals via a simple-to-use website. NetEnt and Microgaming are only a couple of developers that contribute to a diverse gaming library instantly accessible online, and having joined in, players get to collect up to €800 in welcome bonuses. CasinoLand is operated by One Click Ltd and regulated by both the Malta Gaming Authority and the UK Gambling Commission. 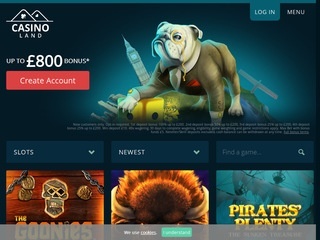 CasinoLand is a multi-provider site featuring products from NetEnt, Microgaming, Play ‘n GO, Lightning Box, 2by2 Gaming, Inspired Gaming, Foxium, Sigma Gaming, Genesis Gaming, and a few other developers. All content is available online, meaning no downloads are needed. Free-play option can be used even before registering and is a great way to familiarise yourself with a new game. The website is accessible not only via PC and Mac, but is also compatible with iPhone, iPad, Android smartphones and tablets, Windows Phone and Blackberry. Beautiful large icons make it easy to scroll through the collection of almost 500 slots, but one can alternatively display only new titles or search for their favourite game by name. The operator has made sure to include all big hits, such as Gonzo’s Quest, Blood Suckers, Warlords, Game Of Thrones, Break Da Bank, Big Bad Wolf, Hugo and Machine Gun Unicorn. If you’re after newer stuff, check out the range of exciting video slots Microgaming has launched in cooperation with small but talented partners, for example Robin of Sherwood (Rabcat), Fortunium (Stormcraft Studios), Temperance (Old Skool Studios) and Samurai Ken (Fantasma Games). NetEnt continues rolling out fantastic new products such as Mirror Mirror, the third in Fairytale Legends series, and Swipe and Roll, a classic with multiplying Wilds, Wild re-spins, Coin Wheel feature and a bonus game. Their Lost Relic uses a 5×5 grid and familiar Cluster Pays mechanics, winning combinations activate one of three random features, and while you’re spinning on the house, a chest hidden behind the reels delivers additional features. Play ‘n GO offers quite a few treats, among which Street Magic and Imperial Opera. In the first, Scattered Wild magician executes one of three captivating performances – the expanding man, the transporting man or Wild shuffle, and what’s more, one can win free spins with sticky Wilds. Imperial Opera is a beautiful Oriental-themed video slot with synchronising reels, those randomly covered with substitute icons, and free games playing with mega symbols 3×3 positions in size. Use filter to display jackpot slots and you’ll gain access to generous progressives such as Major Millions and Mega Moolah. If slots aren’t your thing or you just want to take a break from spinning reels, feel free to pick among about 50 table games. Roulette collection includes European, French and American, allowing players to choose between low and high limit variants. Same goes for Blackjack fans who also get to play Perfect Pairs and Double Exposure. One can alternatively launch Baccarat or Punto Banco, Red Dog, Casino Hold ‘Em, Txs Hold ‘Em, Caribbean Stud and Oasis Poker. CasinoLand is pretty confident the above will be enough to meet your needs, but to be on a safe side, they’ve added several Video Poker games. Despite a limited choice, you will find popular variants such as Jacks Or Better, Deuces Wild, All American and Joker Poker. When you see a Live Casino powered by Evolution Gaming, you know you’re in for a treat. The leading live gaming developer offers fantastic games in each of the popular categories – Roulette, Blackjack, Poker and Baccarat, every single one performing without a fault in terms of design, user interface and live hosts. Make sure to try unique Lightning Roulette, Baccarat Squeeze and Dream Catcher, or pick among multiple Live Poker games. Short but satisfying list of accepted payment methods includes Visa, MasterCard, Skrill, Neteller, Trustly, PPRO and PaySafeCard. They all come free of charge and with deposit limits ranging from £10 to £5,000. You’ll be allowed to withdraw a minimum of £20 per transaction and a maximum of £5,000 per day. It may take up to 3 days for the Casino to process a cash-out request, though they frequently do it within 24 hours. The team has done a fairly good job of providing relevant information within FAQ section and other parts of the site. If additional assistance is needed, you can launch Live Chat, submit a ticket, or give the support team a call using an international number or country-specific UK and Canadian numbers. There will be someone to pick up the phone any time day or night.